Crowdfunding. Should you set up a Kickstarter or a Go Fund Me? What marketing assets do you need? What is your objective? There are many moving parts to setting up a crowdfunding campaign. While creating an account and page can be easy enough, are you prepared to launch your campaign with a strategy in place that can see you through to the end – fully funded? From emotional storytelling that breaks through the noise to reach your target audience, to branded photography and video assets, social media strategies, public relations tactics, and e-marketing and consumer engagement plans, creating a cohesive campaign from start to finish that generates interest and backers is critical. M studio recently completed a Kickstarter campaign for the brand Simple Shoes. A coveted brand that launched in the 90s and developed a cult following during the ensuing decade, the brand is being reinvigorated for today. Our team was tasked with developing a way to raise funds for the company and communicate directly with Simple Shoe loyalists, many of whom still sport the brand’s former line of shoes and sneakers. The plan and strategy was developed over a three-month period. At the forefront, we capitalized on a unique opportunity to rebuild brand equity and create demand with Simple Shoe loyalists by providing access to product ordering before it was accessible to the general public. During this process, pledge levels were determined, e-mail harvesting was initiated, social media and e-marketing calendars were developed, design assets were determined, and press releases were crafted. As our launch date approached, our team ensured every piece of the crowdfunding puzzle was in place for our client. 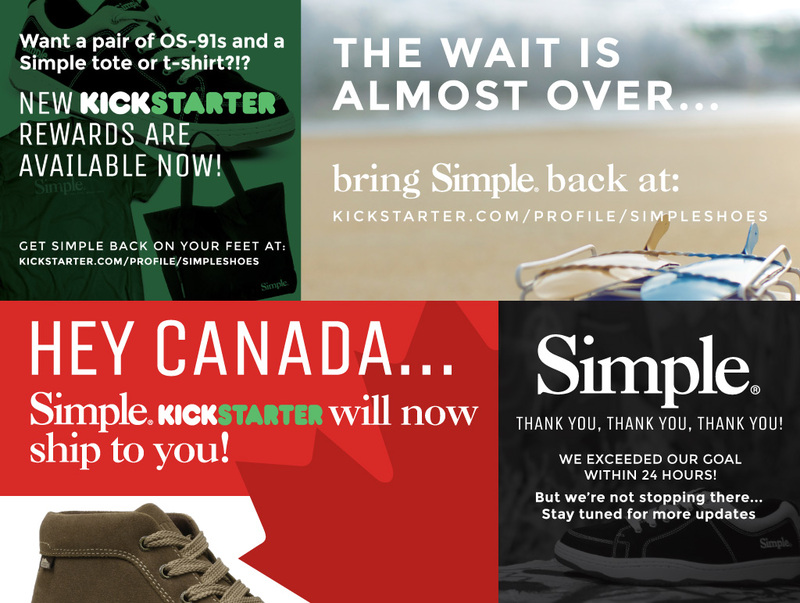 The result: a fully funded Kickstarter campaign that exceeded its $25,000 goal by nearly 500 percent, editorial coverage in GQ, Complex, and Footwear News, heightened awareness for Simple Shoes’ return to market, direct dialogue with consumers from around the world regarding styles, sizes, and product availability. 1. Develop a concept. What is your story and how will it resonate with the public? What sets you apart from other companies? 2. Identify the assets you need to make your message hit home with your audience. This includes video production, professional photography, graphic design and branding, a branded mission statement, goals and purposes, and more. 3. Develop a contact list. Look at your friends and colleagues, and determine who you can contact to back your campaign. 4. Research blogs and websites that cover your industry or write about Kickstarter campaigns. Let them know about your campaign and keep them updated of your progress. 5. Don’t set it and forget it. There is a lot of work leading up to a Kickstarter launch. Once your campaign goes live, don’t go on auto-pilot. A successful Kickstarter campaign requires daily maintenance and interaction. Backers have questions that need answers, and ongoing communications reinforce your audience’s decision to back your campaign. 6. Keep on track with key delivery dates, and communicate any updates to your backers. 7. Contact your backers, and get all required information for order fulfillment immediately after your Kickstarter campaign ends.